I really don’t know what to say about this. I understand Christopher Nolan is a progressive artist, a guy who understands both the necessity of shunning convention and the idea that what one may expect isn’t always the best solution. He’s proven it time and again with the films in his re-booted Batman franchise, starting at the top with a story that involved a villain largely unknown to the masses. He brought in Heath Ledger in a move some thought a bit too outside-the-box, and boy were they wrong. Warner Brothers’ Batman franchise will take a third bow in the summer of 2012. “Shadow of the Bat,” the sequel to 2008’s “The Dark Knight,” will introduce quiz-master villain the Riddler to audiences for a third time after the character appeared in the 1960s television series and 1995’s “Batman Forever.” Funny man Jim Carrey has been tapped to reprise the role in “Shadow,” while helmers Joel Schumacher and Tim Burton, the filmmakers behind the Caped Crusader’s first theatrical franchise, have been brought on as consultants to the production, which director Christopher Nolan says will be his final take on Gotham City. 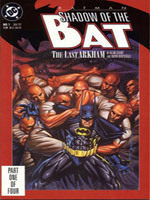 WB is eying a May 2012 release date for the film to coincide with the 73rd anniversary of Batman’s first comic book appearance in 1939. Nolan begins shooting his latest film, “Inception,” with Leonardo DiCaprio later this year for a 2010 release. Read the full story here. I need to go off into a corner somewhere and think hard about this. This is beyond lame. You should be ashamed of yourself. Another movie website has also used TDK2 as their April Fool’s. Who is WB and why are they eying a May release? I would have thought considering the success of TDK it would be another July release. I’m still waiting for the two King Kong sequels that Peter Jackson announced a few April Fools ago…. Peter Jackson’s thing was brilliant. He had everyone fooled with that. Christian Bale told me this when I was making breakfast this morning. Needless to say I was shocked and appalled. Saw it coming, but nice try. CHAD23 is pissed because he got fooled by this and missed his “How to spell ‘was’ 101” course at the Home. Waaaah! Waaah! You aren’t entertaining us sufficiently! WAAAAAAAAH! *rolls eyes* Ha ha ha ha ha…. A lot of that stuff isn’t that bad really… I mean.. Carrey as The Riddler again would work just fine. And hell, Burton made the best Bat-film yet, so I wouldn’t see any problem with that. I liked this. I knew it was an April’s fool, but still that doesn’t mean it’s bad. Outstanding work. Smoosh the Batboys’ noses in it. Nice try. That made me laugh. Although Burton’s Batmans are classic. Well done! I wonder how many sites will pick it up as fact! I thought it was well played. You kept it all in a realistic voice-and had different but equally realistic voices for Nolan and the Variety writer. Jesus, people don’t know how to take a goddamn joke. Too bad I wouldn’t mind serious actor Carrey getting another shot at The Riddler. You can definitely tell this is April Fool’s stuff. No no! Johnny Depp told me that HE is playing the Riddler! I’ll admit. I was fooled. Should have done something believable, but out of left field that anybody expecting AF jokes would good minds would still have read, if only out of hope that it were really true. The Other Side of the Wind to be released this Summer! After successfully wasting everybody’s time, Zack Snyder retires! nice try but ive been fooled too many times today to fall for something that stupid. Cheers to those classy enough to take this in stride and feel the loving good humor of it all today. Too few of you. Whew….Thank goodness this is just an April Fool’s story!! Cause if it isn’t Christian Bale is going to have another….ahem…..moment. And all BB/TDK and BOF fans are crying themselves to sleep tonight. What Kris T. said and BOF was happy to be “in” on it!